Frequent Inspection helps maintain your chairs in great condition for years, which enhances your bottom line by extending service life. The most common issue you'll likely come across is scratches or nicks. Clean any surface damage or debris off the affected area and color in the damage with a furniture touch up pen. With our "Mono-Frame" Chiavari model, no touch ups are needed because the Chair's color is uniform. The color pigment is mixed into the resin and not painted on the surface. After every event, wipe down each chair with a wet towel. If there are any stuck on or stubborn stains on the chairs, use dish soap to clean them. 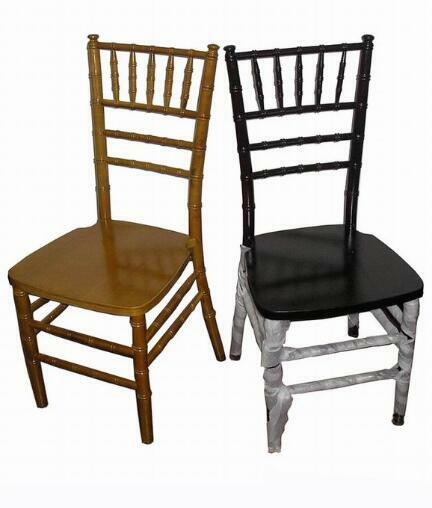 Avoid using harsh chemicals or polishing products to maintain your Chiavari chairs as they could harm the finish. Chiavari Chairs are stackable up to eight chairs high. But Sometimes you may want to keep the stack lower. If you have to travel over uneven terrain, lower stacked chairs are less likely to tip over. You may have to make a few more trips, but your chairs won't get damaged. It's also a "a" the to invest in our heavy-duty Chiavari Chair covers. We have covers for each chair (best solution) or a cover for a stack of seven chairs. The covers help decrease the chances of damage during transportation or storage.